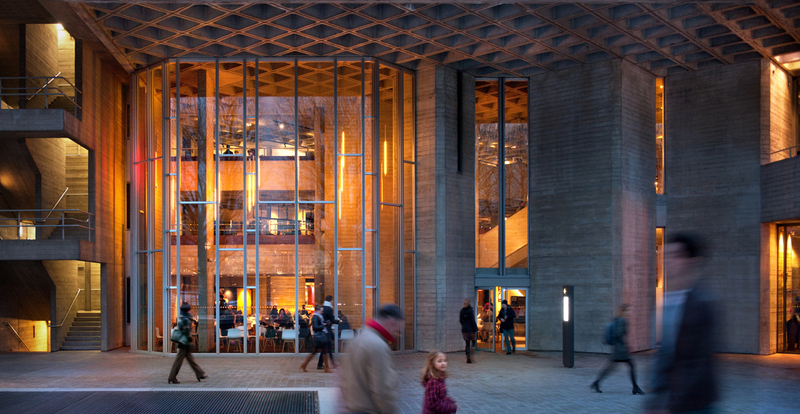 London’s National Theatre has undergone extensive refurbishment and remodelling to transform this Grade II* listed building into a place that brings together world-class artists, emerging talent and the public. This £80 million project, known as NT Future, has created a new scenery art studio, a public viewing gallery as part of the remodelling of the workshops and the new Clore Learning Centre. 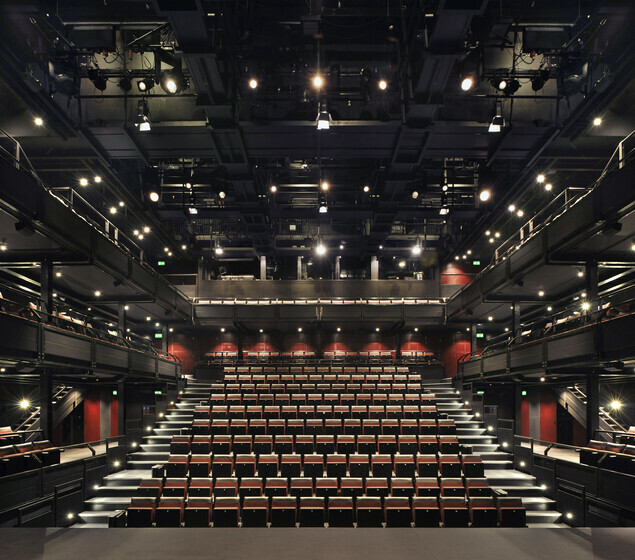 The Cottesloe Theatre reopened as the Dorfman Theatre after a full modernisation programme including an improved foyer. In addition, the main foyers and public spaces of the National Theatre have been revitalised with the creation of new bars and cafés on the riverfront, a new bookshop, a new entrance and the landscaping of the public realm and terraces. 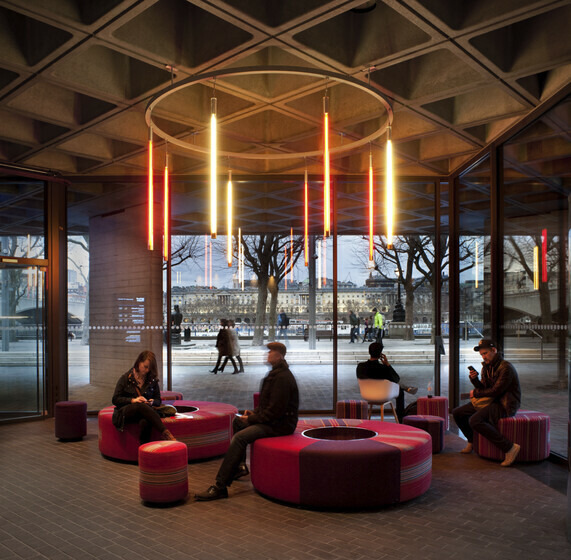 Atelier Ten designed the lighting throughout the new and refurbished areas of the National Theatre, working closely with the architect Haworth Tompkins and the theatre team. Lighting designs had to be tailored to meet the technical and aesthetic demands of the diverse range of spaces. However, the overriding principle linking all areas was a desire to provide high-performance lighting solutions. For the workshops and other back of house spaces, the main driver of the lighting design was functionality. At the time, LED was not sufficiently efficient at the high lumen outputs required, so the decision was taken to use high efficiency T5 fluorescent. Luminaires were selected with optically designed reflectors to ensure light was focussed where required. One of the most challenging environments to light was the triple height paint studio. High illuminance and uniformity were essential on both the floor and the vertical paint frame walls where huge scenery backcloths are hand painted by the scenic artists. As such, Atelier Ten carried out extensive modelling to optimise the positioning and design of the lighting while co-ordinating with the rooflights above, finally settling upon a solution with a combination of wide beam and asymmetric reflectors. The paint studio was designed to make the most of natural daylight from saw tooth northlights in the roof. This presented us with the opportunity to maximise energy savings from daylight dimming. The artificial lighting is DALI dimmable allowing the light output from individual rows of lights to be subtly adjusted as daylight levels increase to maintain a constant illuminance on the painting surfaces. One of the most exciting areas of the project was the re-lighting of the existing foyers. It was felt by many that the existing foyer lighting scheme was overly uniform and bright and had moved away from Lasdun’s original dramatic concept. We collaborated closely with Haworth Tompkins and the theatre team to develop a new lighting concept to reinstate the drama. The starting point was to return the diagrid of concrete coffers back to darkness to give a backcloth against which to add dramatic highlights. The key to keeping the coffers in shadow was using carefully designed fittings to provide the circulation lighting. These were provided with shielding louvres to prevent any unwanted spill light onto the coffers. This “darkness” was contrasted with focused highlights of warm white light to the Brutalist board-marked concrete fins and targeted lighting on tables and benches in the café and seating areas. Elements of accent were used to draw visitors to the cafés and bars using gold reflector cones in luminaires and red-sleeved pendants. Atelier Ten worked with Aether Lighting and Haworth Tompkins to develop a family of luminaires that would bring unity throughout the new and refurbished spaces while providing the technical performance required. Mock-ups and trials were used to establish the optimum LED source and colour temperature. Eventually a 2700K Xicato LED source was selected: it renders the concrete surfaces in a way that is reminiscent of the tungsten lamps within Lasdun’s original vision. Lighting controls are critical to delivering high-performance lighting systems. And from an early stage, we suggested using DALI control to enable the theatre not just to maximise energy savings but to provide maximum flexibility for the future. Indeed, within the main foyers, the use of DALI control was key to success. The existing electrical wiring was relatively new, so to replace it with new power and controls was prohibitively expensive and would mean potential disturbance to the listed interiors. Instead we designed the new controls around the existing mains wiring infrastructure using it for both power and DALI addressable control. This meant that the existing fixed infrastructure could be retained while providing the client individual addressable control of each luminaire. This has delivered great flexibility. The new lighting can be grouped and controlled to suit the new space layouts. This new lighting control system extends throughout the refurbished and new areas. The system uses occupancy sensing and daylight harvesting to dim and switch off lighting where it is not required. A graphical interface gives the theatre’s engineering department straightforward control of the lighting. They are also able to monitor energy use of the lighting through this, thereby providing opportunities for further savings in the future. Through the careful design and specification of lighting and controls it has been estimated that the energy savings could be as high as 70%. The actual saving is still to be determined as the building beds into its first year of use, but one thing that is already clear is that the new lighting scheme has returned a sense of purpose and drama to the theatre.